Make Supersized seem small. Get images that. ​IF TOTAL OVER £40.00 THIS WILL BE AT SIGNED FOR RATE. For sale is a very good early Victorian cover with an imperf penny red. The cover was sent from York to warrington in 1841. The stamp is on blue paper and has a heavy maltese cross cancel. From Balmoral Castle. 1897 Letter written by Queen Victoria. GREAT BRITAIN: 1897. Mounted on Album Page. REST OF WORLD (UPTO £40) £3.00. UK RECORDED (UPTO £100 TOTAL) £2.00. UK ORDINARY (UPTO £40 TOTAL) £1.00. GB 6d Rate Cover, 6d Mauve Plate 8 SG 109 to Italy. Queen Victoria covers as shown. GB. QV. 1d RED(STARS) ON COVER. NORTHAMPTON SPOON CANCEL. 1d RED(STARS) ON COVER. NORTHAMPTON SPOON CANCEL. Stamp has vertical filing crease. London CDS on back. Stamp, which has diagonal crease across top left corner, cancelled by London 17 in diamond with large Epping CDS at bottom right. London CDS on back. Stamp a little oxidised and other faults to envelope. Make Supersized seem small. Get images that. ​IF TOTAL OVER £40.00 THIS WILL BE AT SIGNED FOR RATE. ____________________ __________. For sale is an early Victorian cover with an imperf penny red. It was sent to Oxford Mount near Warrington in 1844. London N & Watford CDS's on back. GB. QV. 1d RED(STARS) ON MOURNING COVER TO KENT. SUPERB WORCESTER CANCEL. 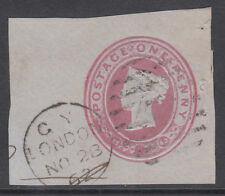 1d RED(STARS) ON MOURNING COVER TO KENT. SUPERB WORCESTER CANCEL. For sale is a Victorian cover with imperf penny red on blue paper. It was sent to a Mr. Peters, Grocer, of Oxted Surrey in 1855. Neat scarce blue PAKENHAM Suffolk undated circular on the reverse of a neat QV 1d red imperf cover to Walsham-le-Willows. SG c£325.00. PO Box 176. Signed for : £7.95 (item over £40.00). Standard: £2.50 at (item under £40.00). Rest of World. International Signed for: £7.95 (item over £40.00). Standard: £1.65 (item under £40.00). 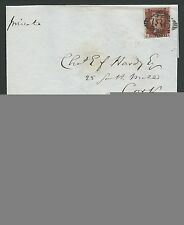 For sale is a very good Victorian cover with letter and imperf penny red. The stamp is on light blue paper, with a cancel having a diamond with an 8 in it. Letter is on very fine paper. 1867 env Worcester Spoon-Thetford-London redirected 2 x 1d red HD Plate 94 +?? Hull CDS at top right with '1d' to right in red. MOST FROM BIRMINGHAM REST FROM LONDON. Cover is badly creased with Great Yarmouth 927 duplex cancelling stamp & Norwich & North Walsham CDS's on back. For sale is a small Victorian cover with a pink embossed one penny stamp. It was sent from Wakefield to Morpeth in 1852. Interesting 1842 cover with Maltese Cross and CUMNOCK Scottish town mark.